The question facing the Imperial War Graves Commission at the end of the First World War was how to honour the men who had no known grave. The answer it came up with was to record their names on memorials sited on the most significant battlefields. The Commission engaged three of the most distinguished architects of the day to design these memorials. 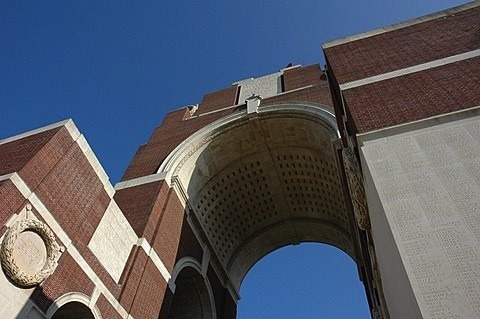 And so it was that Sir Edwin Lutyens put his name to the magnificent Thiepval Memorial to the Missing of the Somme. Another of the Commission’s Principal Architects, Sir Reginald Blomfield, came up with the most famous Commonwealth Memorial of them all, the Menin Gate. It was, he said, one building he had designed which he would not have changed a single brick. It’s here, at 8pm every night, the Last Post is sounded to remember those who died in the Ypres Salient, and by extension, for all those who died in the First World War. Sir Herbert Baker had the task of laying out Tyne Cot Cemetery near Paschendaele. At the back are recorded the names of all those who died around Ypres after 16th August 1917 since there were too many names for the Menin Gate. Here too is a special New Zealand Memorial. There are other major memorials too – on the Western Front there is one at Loos, Arras, Ploegsteert, Pozieres and Cambrai – filled with the names of soldiers who have no known grave. And elsewhere there’s the Helles Memorial in Gallipoli, Basra in Iraq, India Gate in Delhi and so it goes on. Royal Navy men are remembered on three identical memorials at Portsmouth, Plymouth and Chatham, while airmen of the Royal Flying Corps, the Royal Naval Air Service and the Royal Air Force have their own memorial on the site of the Arras Memorial.